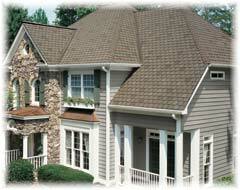 Berkshire® Collection shingles offer more than a great looking roof – they offer you a beautiful home. Natural slate colors and textures blend with your home's natural surroundings to create an attractive and more impressive look for your home. Compatible with a variety of architectural styles, Berkshire Collection shingles have the look that will get people talking. Berkshire Collection shingles are backed by a limited lifetime warranty* with 15 years of Tru PROtection® coverage and 15 years of algae-resistance protection. Berkshire shingles have 10 years of 110 mph wind-resistance warranty coverage. Berkshire Hip & Ridge shingles, ventilation and waterproofing underlayment products are required for a complete roofing system. Nominal Size: 18 3/4" x 38"
Coverage per Square: 99.5 sq. ft.